Figure 1: The upper part of the gluteus maximus connects predominately to the trochanter mayor, the lower part reaches mainly the part of the femur adjectant below. The indentation created behind the trochantor mayor by the lower part is especially marked during contraction of the muscle. Figures 2 to 7: The bottom is located in-between the two trochanter. Fig. 8: If the trochanter blends well into the contour defining the shape of the hip, it may appear as if the hip is entirely and essentially formed by the bottom. Fig: 9: The ventral body position may also suggest that the hip is entirely formed by the bottom. 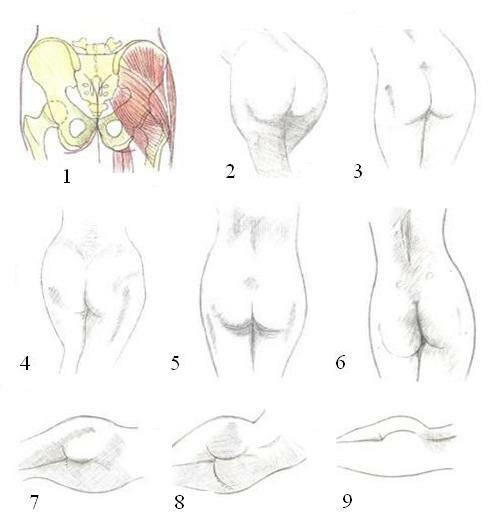 Figures 1 to 5: Note the variable form of the female hip.